Based on our spectrophotometric observations, we have investigated the envelope of Nova V339 Del in the nebular phase. Our modeling of the Hα line profiles and their comparison with the observed profiles have shown that the Nova envelope consists of circumpolar ejecta and a disk-shaped central component. The inclination of the orbital plane of the binary system, 65°, has been determined in the same way. We have estimated the mean electron density to be ~106 cm-3. Our estimates of the abundances of some chemical elements in the Nova envelope have shown that the concentrations of helium, neon, and iron are nearly solar, while the concentrations of nitrogen and oxygen exceed the solar ones by a factor of 120 ± 60 and 8 ± 1.6, respectively. The mass of the emission envelope in the nebular phase (from 253 to 382 days after the brightness maximum) has been estimated to be ~7 × 10-5 M ⊙. Original Russian Text © T.N. 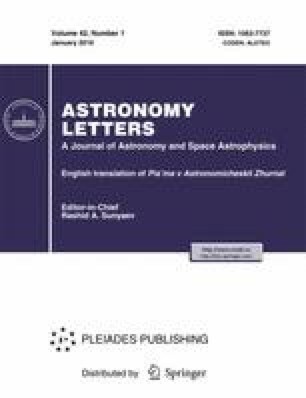 Tarasova, A. Skopal, 2016, published in Pis’ma v Astronomicheskiĭ Zhurnal, 2016, Vol. 42, No. 1, pp. 13–32.